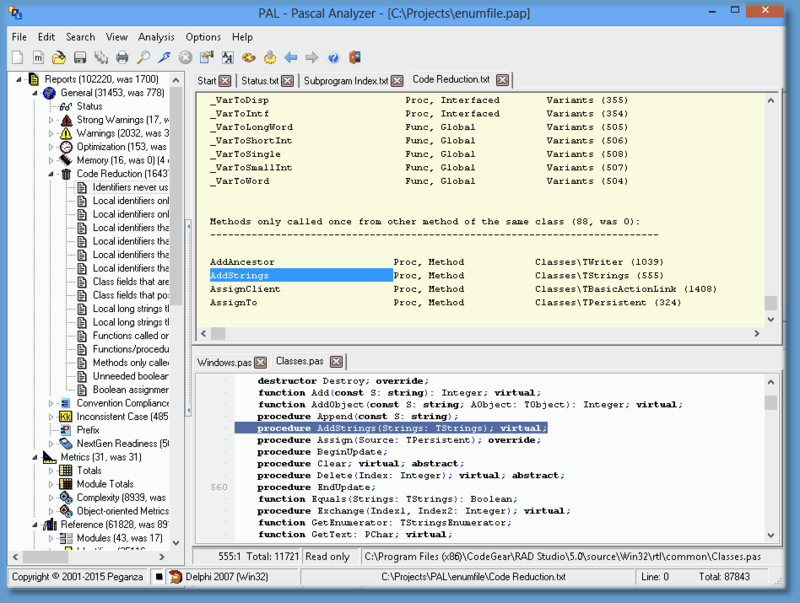 The main interface of PAL consists of a menu, a toolbar, a report list window, an editor window, and a status bar. The toolbar provides speed buttons for common menu items, and the tree view enables quick report selection. There are horizontal and vertical bars dividing the report list, report viewer and source viewer windows. Click on the bar with the mouse and drag it to change the sizes of the windows. If you click the hotspot button in the center of the bar (or F9), the report list window will be temporarily hidden. Click the hotspot button again (or F9) to make it visible. Click on the report window hotspot button (or F8) to toggle on/off viewing of the source window. Select Options|Arrange in the menu to choose between possible arrangements for the report list and viewer windows. The toolbar contains speed buttons for some of the most common menu selections. The report list is displayed as a tree structure with reports. At the level below the reports, there are sections for the reports. Some reports only have one section, and in this case only the report level is shown. If one or more report sections should be turned off (not selected), you will be notified of this by the report caption. Click on an item in the report list window to move to a report or a report section in the viewer. The report is loaded in the report viewer window. You can also use the mouse-wheel to change font size in the report list. HTML format (default) is suitable for web publishing. There are also more ways to customize the layout and appearance of the reports. An advantage with text files is that they are faster to load. Navigate in the text by scrolling or with the PgDn/PgUp keys, or click on an item in the report list. The following commands are available in the viewer for reports in text format. For HTML and XML reports, PAL uses the browser component in SHDOCVW.DLL, a library included with Windows. This gives the browser in PAL capabilities similar to the browser in MS Internet Explorer. - A source window is opened and the relevant source file is opened and displayed in the built-in editor (default). The cursor is positioned on the line. There are buttons to move back or forward through the list of source locations. - The source file is opened in the editor window in the Delphi IDE and the cursor is positioned on the relevant line. Normally, double-click the word that describes the location of the identifier. In the report above, double-click on “GAsmCode” to locate the corresponding source line. To locate each reference in this report, click on “782r”, “805r” and so on. Double-clicking on a line will in most reports trigger this action. One of the exception however is the Uses Report. Of course, if you edit the Delphi source code, it may happen that the code line numbers in the reports are not longer valid, for example after deleting or adding lines. Double-clicking in the report will in this case probably locate the wrong line in the source code. To select the action taken when double-clicking, in the source viewer, go to the Preferences Dialog. There are some DLL modules that are used to interact with the Delphi IDE, PALWIZ*.DLL, for various Delphi versions. The editor window contains one or more tab pages. Each tab page is a separate editor. Use it to make modifications to your source code. To open a source code file, double-click on an identifier in a report. This is only available if you have selected to open an editor window (see Preferences - Source Code). Editor files are optionally backuped to a history folder, just like in the Delphi IDE. Editor files also support different formats, like ANSI and UTF8. The editor will try and auto detect the format while loading the file. The status bar presents different information, such as the currently loaded report file.